Interested in learning more about trends in the construction and building products industry? We compile our research into a quarterly newsletter that discusses our thoughts about how recent activity has affected the market and where it's headed. Want to learn more? 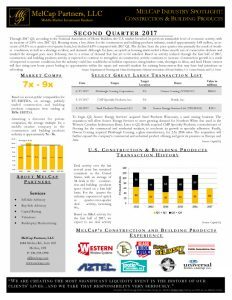 Sign up for our Construction and Building products Quarterly Newsletter today! We'll also sign you up for future updates. Interested in where we see deal activity for the market headed? Download our free newsletter today!